It’s More than a Book! How do we come home? Jon says it starts with awakenings – five of them. 1. Awakening to longing – there’s got to be more. 2. Awakening to regret – I wish I could start over. 3. Awakening to help – I can’t do this on my own. 4. Awakening to love – God loves me deeply after all. 5. Awakening to life – Now this is living! You can listen to an excerpt from interview on the “Live the Promise” program right here. Earlier this week, my friend and NewThing movement leader, Joe Wilson told me he had just a handful of books left from the many that he bought and is handing out to friends and family whom he knows will benefit from the message of the book as well. Then yesterday “Finding Your Way Back to God” was listed as the #1 Seller in the Faith and Spirituality category among Kindle books on Amazon. If you’ve followed this blog or heard Dave or me talk about this book, you know it’s more than a book, for us it’s a life-long mission. We want to be all about helping people find their way back to God! We’re already in Week 4 of our Finding Your Way Back to God series at Community. Our Creative Arts Team produced a short video to introduce people to the series. We posted it on the Finding Your Way Back to God landing page on the church’s website and encouraged people to post it to Facebook and Twitter as a great way to encourage their friends to check out the series at Community. I’ve been so focused on Community‘s next series, “Finding Your Way Back to God” that I haven’t had a chance to write a few reflections on our previous series, “MINE.” This series focused on three truths from scripture that we need to embrace in order to experience the financial freedom that God wants for us. The last of these three truths is this: “When I put my trust in God and give generously, I will experience the joy of building a lasting legacy.” I have no doubt that the number one reason people can’t buy into this truth and truly bank on it is because they are afraid. Afraid to trust God when it come to their finances. I know so many people – very good friends of mine who love Jesus a lot, and have trusted him with so many aspects of their lives, but have yet to trust God when it comes to their money. And I also know that people who have yet to trust God with their money, look at those who live on 90% or 80% or even less so they can be generous, and think they are crazy – “How can you possibly think you will actually be better off with less?” And those who have grown to live on 80% or 90% or less of their income while giving God the rest, look at those who can’t imagine living on anything less than 100% of what they bring in and think, “How could you possibly think that you can do better without including God in your financial picture?” They both think the other is CRAZY! It reminds me of what the Apostle Paul said to Timothy: “Tell them to use their money to do good. They should be rich in good works – generous to those in need – ready to share with others. By doing this they will be storing up their treasure as a good foundation for the future so they may experience true life” (1 Timothy 6:18-19 NLT). Through Paul, God is saying that the way to true life – freedom, is to trust God with everything we’ve got, including our finances. And the most clear and obvious step we can take to express our trust in him is to be generous. So my question is this: What kind of crazy do you want to be? Will you let the idea of being generous and trusting God with your money intimidate you and stress you out, or will you take the courageous step to experience God as the loving, faithful Father he has so often show himself to be, providing for us over and over again? Will you be CRAZY generous? My Life Has Drastically Changed! What Emily shares below in just a few lines captures the essence of why Dave and I wrote “Finding Your Way Back To God.” If you are tired of religion and looking for a relationship or know someone who is longing for that as well, pick up a copy of our new book and take advantage of the “Buy 1 Get 1 Free” Offer, while it’s still in effect. I found my way back to God 7 years ago and my life has drastically changed in AMAZING ways! I no longer suffer from anxiety, I have replaced shame and guilt with grace and mercy and I no longer long for acceptance knowing I am accepted and loved right where I am. I by no means live a life of perfection but I do live a life of purpose. It’s not about my religion it’s about my relationship. 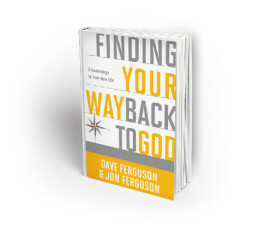 If you are looking for the same click on this link and check out the book Finding Your Way Back To God written by Dave Ferguson and Jon Ferguson who started our church and forever changed my life!! At Community and NewThing we have believed in and experienced the benefits of a strong internal leadership pipeline, where we are constantly developing the next generation of leaders right in our own context. This leadership pipeline has yielded a number of benefits. 1) The Pipeline Results in “Conversion” Growth. In the church world there is conversation about conversion growth versus transfer growth. Conversion growth is the result of people who find their way back to God in your church. Transfer growth is the result of someone coming to your church from another church. Community and NewThing want to be the source of new leaders. We want to constantly be raising up and developing new leaders within our church and movement. We have several senior level leaders who found their way back to God at Community and have now become some of the most influential leaders in our church. 2) The Pipeline Gives Apostolic Leaders a Dream. Many of our leaders are developed in the context of our adult small groups. One of the challenges of a small group is that they are by definition “small.” Anyone who has experienced the power of a dynamic, community-building small group, knows the impact is anything but small. 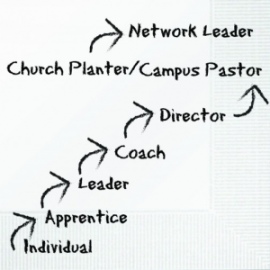 Apostolic leaders need to see a path by which their influence can expand beyond a single small group. The pipeline gives them a vision for how they can develop more and more leaders and over time increase their influence and impact. 3) The Pipeline Lets Us Promote from Within. When we are looking for new staff, our first thought is to ask, “Who do we have in our leadership pipeline?” Our preference is to always promote from within. When we hire from within we know what we are getting. We have seen firsthand what this person can do. Promoting from within is less costly, as it saves you the cost of a search firm. It is faster, as you are able to hire someone who is already in your church or organization. It is more certain, as you have been able to observe this person in action over time. 4) The Pipeline Challenges Leaders to Develop New Skills. Leaders look at this pipeline and they realize that they are going to need to continue to be lifelong learners if they hope to continue to expand their influence. They will recognize that the skills required to lead a small group are not the same skills required to coach other leaders or to pastor a campus or church plant. One of the most important qualities of a leader is teach-ability. The pipeline demands that leaders become life long learners. 5) The Pipeline Increases the Lifespan of Leadership. In this leadership pipeline there is no room for leaders to get bored or feel like they have no opportunity for expanded influence. It can take years to move through this pipeline. John Ciesniewski is now a movement leader at Community, which means he is actually responsible for several network leaders. He started as an individual or attender at Community 15 years ago. 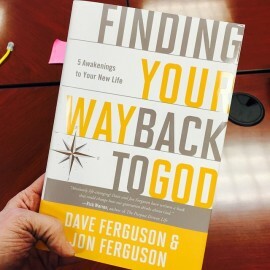 Even though the official release date is February 24th, a few people have started reading Dave‘s and my new book “Finding Your Way Back to God.” I was so encouraged by this email I received earlier this week . . . Sway Session 2 – What Happened Last Weekend? One aspect of a pastor’s job is to ensure that the weekend services lead people to a closer relationship with God in a clear and compelling way. It is so easy to fall into a rut or let the services become predictable and less than engaging. A while back, my good friend, Bob Bouwer, from Faith Church in Dyer, told me about a process that he uses with his campus pastors to help them reflect on the previous weekend’s services. They have a 30 minute stand up meeting every week to evaluate the services. In that meeting they cover what he refers to as the 4 M’s. 1) Music – How was the music? Was it up to standards? Vocally, instrumentally? Did we really lead people to worship? If there was a special song, how was it received? 2) Message – How was the teaching? How well did we deliver the Big Idea? Were we on time? Over time? Was there a clear application and next steps? Was there anything distracting about what was communicated? Is there any way that you would handle that topic differently if you were to talk about it again? 3) Moment – Where was the key “moment” in the service? We hope that every service has people experiencing a full-range of emotions from laughing to crying that results in life-change. Did we achieve that? And what would you identify as the key moment in the service? Where did we peak emotionally or spiritually with people? 4) Mess-Up – Where did we blow it? What simply did not go as planned? Was it the sound? Lighting? The talk? The music? This is where we are brutally honest and say what didn’t work and what we can do to ensure it won’t happen again. With the upcoming publication (2.24) of Dave’s and my new book, Finding Your Way Back To God, the publishers have been encouraging us to do some marketing. Shocking, I know!?! So we thought we would give away some stuff for FREE? One of the really cool ancillary products that we have created is a 60-page booklet, Can I Find My Way Back To God? It is designed to give to a friend, neighbor, co-worker or a first time attender at church. Just for fun (and since I don’t really like selling stuff!) 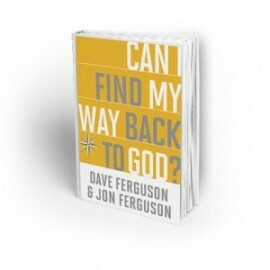 I will give away a FREE copy of Can I Find My Way Back To God to the first ten people who ask me for it in person. Not a bad deal, huh? Soon after moving to Chicago in 2011 I was sitting in a downtown Starbucks when the group of young people at the next table suddenly held hands and launched into a prayer session. “That’s so weird!” I said to myself. How could I have imagined that four years later I would be standing here, doing this. Despite being raised in a Christian household my adult years had seen me drift further and further away from God and a Christian lifestyle. Sunday mornings were given over to the kids’ sports, the gym or just catching up on work emails. And when I did go to Church it was more through a sense of obligation than any real desire. On the surface things were going well. I had three great, healthy kids, a smart attractive wife and a string of promotions and salary raises at work which gave us a good lifestyle. Yet underneath it all I was losing myself and falling into an increasingly self-centered lifestyle which was putting my marriage and the future of my family at risk. Things had reached a crisis point by 2011 and the decision to move to Chicago was in some ways a symbolic act of making a fresh start. I also hoped that it was a chance for me to make my fortune with a lucrative big job at a top advertising agency. And perhaps it could have been all those things. But instead, I chose to persist with some of my bad behaviors of the past and inevitably things continued to spiral downwards. It was then we met Jon and Lisa and began, very tentatively, to take our first steps back from the brink. As an Englishman I was of course deeply suspicious about any church featuring guitars, tambourines or the raising of hands. And yet when each week we heard the message it was as if someone had been listening in on our private conversations and were talking directly to us and to our situation. It hit me like a train and in a way that no other church had ever reached me. For the first time ever I actually began to look forward to church on Sundays. For a long time I resisted the idea of baptism because, honestly, I felt too broken, too unworthy and I did not want to be a hypocrite, pretending to be one thing when I knew I was something different inside. But Community and my Small Group helped me realize it’s because we are lost that we need the right guide. I have a long journey ahead of me but with this act of baptism I am asking Jesus to be my guide. I came to Chicago for a fresh start and to find my fortune. The crazy thing is that I have, but not in the way I imagined. 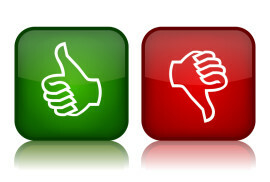 I lost my job at the end of the year and with it a lot of income and stock that would have made us financially secure. The year ahead is full of uncertainty, but I somehow know we will be OK. I have rediscovered my wife, re-engaged with my children and above all I have once more found my God. How blessed am I! It’s Here! FYWBTG Has Arrived! 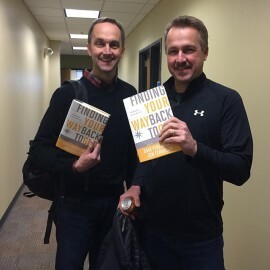 Yesterday was an unexpectedly big day as Dave‘s and my new book, Finding Your Way Back to God finally arrived. We knew it was to be released on February 24th, but we had no expectation of having it in hand any time before that date. On Tuesday, we received word from our publisher, agent, and editor that they received copies in the mail. And then, finally, yesterday three boxes of books arrived at the Yellow Box in Naperville. After much work, worry, and writing, it does feel good to actually hold a copy in my hand. Dave and I are so grateful for everyone who contributed to this project. This was not a one-man or even two-man effort. This book is the result of literally thousands of people who have contributed to the mission of helping people find their way back to God at Community as well as other places all over the world. We are honored to have the opportunity to put the message of this mission in the hands of thousands of people. If you would like a copy of the book, download a free excerpt, or get information about other book-related resources, be sure to find your way to the webpage we’ve set up specifically for you to place your order today.